Hi everyone. There's no possibility of blooming flowers in my world today as we are going to get some snow. Not a little bit of snow, but they say a lot of snow. What happened to that gorgeous spring weather we had last week? Here's another page in my nature journal. 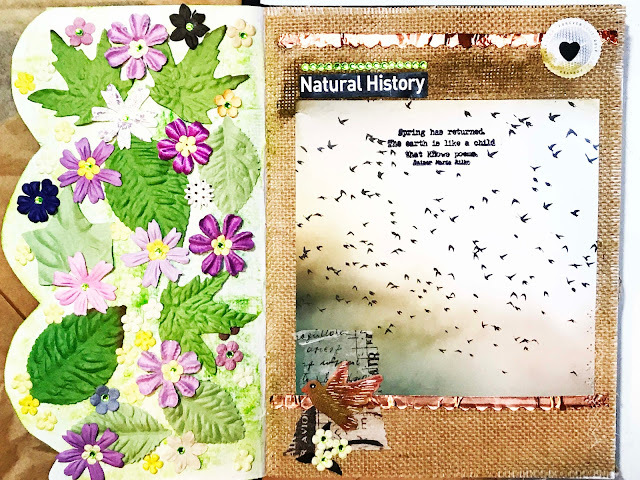 My inspiration was this photo of all the birds migrating that is the centerpiece on the right hand side. I can't take credit for taking this photo but it is really cool. The photo was on an ad I received in the mail. On the left side I had a page that I cut to make it smaller and gave it a scalloped edge. I decided just to cover this side with paper blooms and leaves.Those flowers look like spring flowers to me. I lightened up the photo so you can see the bottom of the burlap a little better. I used some copper tape, a bird die cut, a few more paper flowers, some paint, a postage stamp, some gemstones and a bit of scrap paper to make the right hand page. I hope your world is sunny and spring like today. And if you want, I can try to send some of our snow your way-hee-hee. After very bad snowy and icy weather recently we git sunshine now and even some degrees above freezing today... I so hope the snow will melt soon - was even on a nice walk already with the dogs! I bet this will also come soon for you ... yesterday I hadn't thought that - it was so frosty and so much snow! I am quite sure your wonderful pages will us all bring spring soon! Thank you very much dear Erika for another fantatsic entry linked to the collection at Art Journal Journey!I love how detailed and beautiful you played with the recycled photo and the burlap - looks amazing with the left part of wonderful flowers and leaves! Thinking of you and sending sunshine in your direction my friend! We'll have to dream very hard for Spring after today. I'm glad you made a gorgeous Spring spread. I just looked out the window and at 8 AM, it's snowing lightly. The weather dudes said it wasn't supposed to snow until early this afternoon! Hope you're getting a half day from school. Be careful driving. 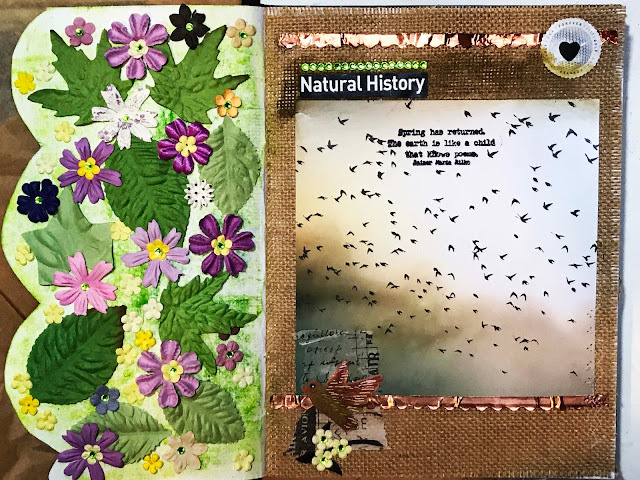 This is a gorgeous journal spread, the spring flowers look beautiful and it was a lovely photo to use with the birds. I'm really sorry but after our snowfall keeping me home for nearly a week, I will pass on your kind offer to send us some of yours. Stay safe Erika, I hope it will not be too bad a fall. We also had two days springlike weather, but today it was frosty again. Hi Erika, I love your art page. I hope you don't get all that snow that is predicted. that's a bummer if hobby lobby will carry less of the stamps-I wonder if people are not buying them as much as they used to. I don't care for those plastic ones. Oh I do feel sorry more snow is heading your way, - here the sun is finally shining and the snow is melting fast. Your page in your nature journal is super, love that burlap (or hessian as we call it) background and the scallopped panel with all those gorgeous colourfulflowers gives a real feeling of Spring. The other side with the stunning photo balances it all out perfectly, - love it! Your spring page looks happy! I've been thinking about you and the snow. Hang in there -- watch your back! Such a beautiful Spring spread! Stay warm, and I hope it's not too much snow Erika! A lovely Spring page and I hope your snow doesn't last too long. Ours lasted a week and once the temps lifted the thaw only took a couple of days and it was all gone. Back to Spring now.